Mehbooba Mufti was returning after offering prayers at the Khiram Dargah, which is revered by the local Muslim population. SRINAGAR: A few youngsters Monday hurled stones on PDP president Mehbooba Mufti's carcade while she was electioneering in South Kashmir's Khiram area, leaving her security guard injured, officials said here. Mufti was returning after offering prayers at the Khiram Dargah, which is revered by the local Muslim population. A Special Services Guard (SSG), a force carved out of Jammu and Kashmir police to protect the serving and former chief ministers, was injured, the officials said. A spare vehicle in her motorcade was also damaged, they said. Police present at the spot chased the youngsters and later detained them for questioning. Others in the entourage, including the PDP president, escaped unhurt. According to the preliminary report, the youngsters were expressing their unhappiness over the PDP's tie up with the BJP after the 2014 assembly elections. Traditionally a bastion of the PDP, Khiram is located 77 km from Srinagar and is surrounded on three sides by mountains, separating it from Sallar in the east and Tral and Shikargah in west and north, respectively. 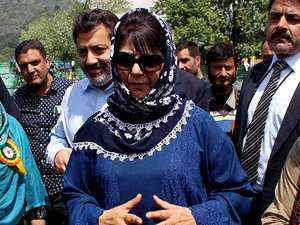 Mufti is contesting the Lok Sabha election from the Anantnag seat, which she had won in 2014. The constituency, is spread over the four districts of Anantnag, Kulgam, Pulwama and Shopian and it is going to the polls in three phases from April 29 to May 6.